The snow has arrived in many parts of the UK and wintery weather is forecast across the country. 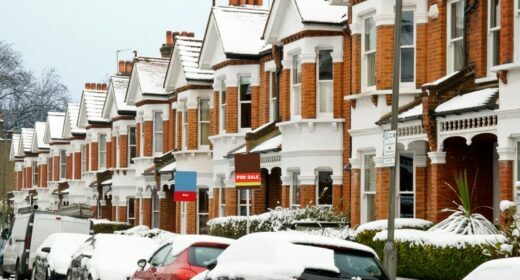 Aside from boosting the central heating and digging out your thermals what should you be doing to protect your home when the temperature drops? The BBC is predicting that another Beast from the East is heading for the UK. It seems like every cold snap since March has been hailed as another beast. If in fact the temperatures do plummet it can cause a lot of damage. Get your heating on – You should heat your home to at least 18c during the day, according to the Met Office. At night keep it above 12c to protect your pipes from freezing. Find out how to get the best out of your central heating. Locate your stopcock – If cold weather causes a burst pipe you need to know how to turn off your water supply quickly. Remind yourself of where your stopcock is – it’s usually under your kitchen sink. Service your boiler – If you’ve not had your boiler serviced in a while, do it now. Prices start at £89 with our partners at Plentific. They can find your local engineer and you can book instantly. Pay through their secure payment system so your money is protected. Insulate your pipes – Any exposed pipes outside the house or in cold areas such as garages, attics and kitchen cabinets should be insulated. Use either UL-listed heat tape or foam rubber insulation to prevent them from freezing. Batten down the hatches – If the wind comes it can cause chaos blowing loose items around. Secure items that could take off such as garden furniture, children’s toys and trampolines. Top up your insulation – Check your loft insulation is complete and thick enough – the recommended depth is 270mm. You can pick up rolls of insulation at your local DIY store. They are easy to roll out so this is an easy job to do yourself. Gather phone numbers – If the bad weather brings about a power cut or your internet goes down would you know who to contact in an emergency? Keep a list of important numbers such as your plumber, electrician and roofer somewhere you can easily find it. If the snow has arrived should you clear it from your driveway and pavement? There is a myth that does the rounds every time the snow falls – that being a good neighbour and clearing your pavement could leave you liable if a passer by falls. This is not true. The Department of Transport has clarified that people walking on snow and ice have a responsibility to be careful themselves. So, feel free to clear the snow, just make sure you do a good job! Avoid using water to melt the snow. If temperatures are below freezing that water could quickly turn to black ice. Instead use table or dishwasher salt to clear the snow. A tablespoon for each square metre should do the job. But, be careful what you sprinkle with salt. Keep it off plants or grass as it could damage them. If you are shovelling snow be careful where you dump it. Avoid blocking drains, and don’t damage neighbourly relations by moving it onto someone else’s path or driveway. How can I cut my gas bill? How can I flood proof my home?